With Honeycomb Solutions, you'll quickly realise value from your Windchill ProjectLink investment. Our experienced consultants incorporate our standardised, cost-effective approach into every service offering to ensure a successful implementation with widespread user adoption. Packaged installation services ensure your system is up and running quickly. 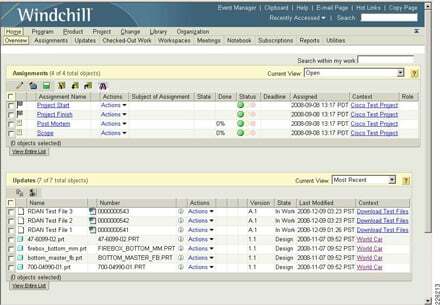 Configuration services enable customers to quickly take advantage of the powerful validated process capabilities within Windchill ProjectLink. Personalized configuration services designed to meet unique customer requirements are also available. Performance tuning services and security setup ensure optimal system performance. In an effort to continuously improve internal processes, manufacturing companies are investing in Six Sigma, APQP and/or Portfolio Management initiatives. Honeycomb Solutions delivers pre-packaged reporting services specifically designed to support these initiatives. Unlike many Solution Providers, Honeycomb Solutions recognises that widespread adoption is critical to any technology deployment. Honeycomb Solutions' adoption services drive user acceptance through role-based needs analysis, training, and organisational readiness planning. Integration between Windchill ProjectLink and Pro/ENGINEER or third party CAD tools ensures everyone is working with the most recent product data. Whether you are migrating to Windchill ProjectLink from another collaboration tool or upgrading to the latest Windchill PDMLink release, Honeycomb Solutions has the tools, methods, and experience to make this an easy, low-risk transition.